K9 units are certainly nothing new. Police forces and militaries across the globe have used incredibly brave and talented dogs to do everything from bomb detection and drug sniffing to 911 dispatch and ivory sniffing to stop poaching. Now it’s time to add a new category of K9 unit! 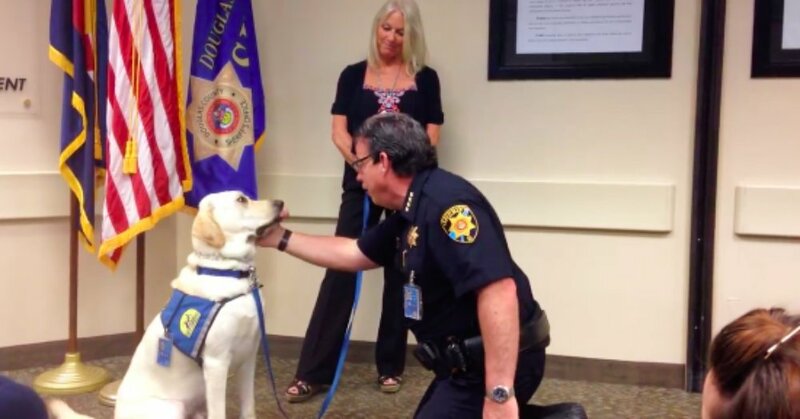 This yellow labrador has spent years with his handler learning how to best serve his community and today’s the day that all his hard work pays off. The Douglas County Sheriff’s Office in Colorado swore in their newest recruit, Pilot, in order to offer an new dimension to their K9 units. Pilot will work with the department as their first victim assistance dog, and help comfort victims during the most difficult experiences of their lives. Before getting started in the field, Pilot had to be sworn in as an officer, and it might be the most adorable oath taken by anyone on the force!